Home Tags Articles tagged with "business"
Ten of the 12 Maricopa food facilities inspected by Pinal County Environmental Health July 17-Aug. 15 received scores of excellent. Two had minor problems that were dealt with during inspection. 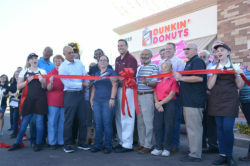 Dunkin’ Donuts had issues with food temperature and hygiene. Egg flats, which should have been no warmer than 41 degrees F were measured at 51 degrees and had to be discarded. The inspector also noted staff with polished fingernails, which are not allowed in food-prep, a situation that was also corrected. The Silver Spur at The Duke at Rancho El Dorado posted a satisfactory score after observed violations in food-holding temperatures and dated food. 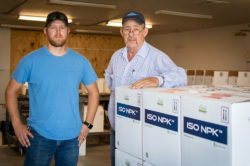 The inspector observed a prep table holding food at 52-56 degrees instead of the mandated 41, and a walk-in refrigerator holding food at 50 degrees. 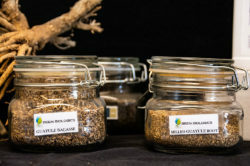 Several food items were reported to be seven days past their date marking. The inspector also noted freezer equipment with icicles on the ceiling, ice on the floor and no light. The following organizations received business licenses from the City of Maricopa July 16-Aug. 15. The last five months of the fiscal year showed steady growth in Maricopa’s business activity. The city reaped more than $1 million each month from January through June and easily outpaced last year February through June. City Finance Director Brenda Hasler said that coincided with construction and the opening of more retail outlets. Edison Pointe, in particular, boasted new builds and six new openings to generate more sales tax for the city. In fiscal year 2017-18 (Graph 1 in green), Maricopa took in $12.5 million in transaction privilege tax, often called sales tax. The previous fiscal year, the total was $11.2 million. Retail and construction continue to be the city’s highest earners. As shown in Graph 2, the FY18 total is the highest for Maricopa since before the recession. The city has a way to go before returning to those money-generating highs. In FY08, the city collected $18.7 million in sales tax. As Harrah’s Ak-Chin Casino continues its multi-million-dollar expansion, it has opened The Spa. The business within the complex offers massage, waxing and facial treatments and a full-service nail salon. Its grand opening was announced Tuesday. The spa features four treatment rooms including one couple’s suite. Features include adjustable beds, complimentary LED Light Therapy in each treatment room, a dedicated Esthetics Room with back bar feature, and the Signature Hungarian Face Massage. The spa uses Eminence and Farmhouse Fresh treatments. The Spa at Harrah’s Ak-Chin is open Monday–Saturday from 9 a.m. to 8 p.m. and Sundays from 9 a.m. to 6 p.m. Reservations are required at 480-802-3340. 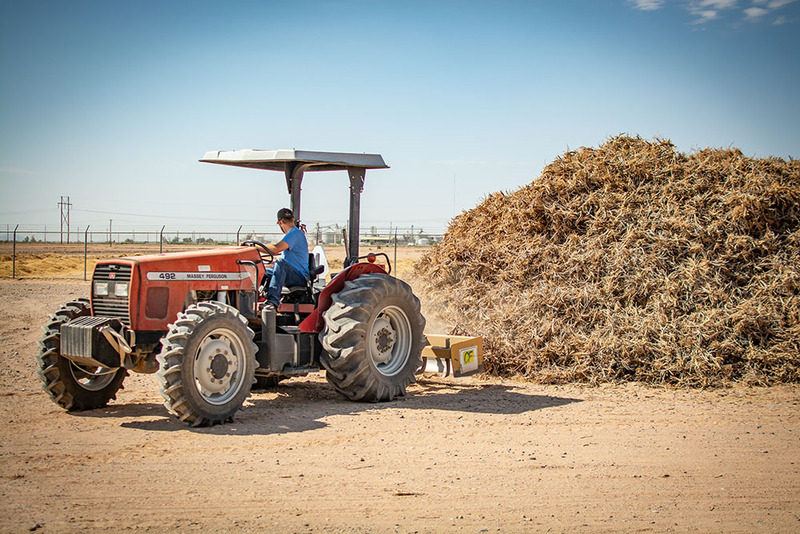 Among its incubation tasks, the now defunct Maricopa Center for Entrepreneurship (MCE) distributed business loans funded by the City of Maricopa with a U.S. Department of Agriculture Rural Business Development grant. The loans totaled $116,000 at a 5 percent interest rate. Years later, more than $98,000 remains to be paid on the loans. 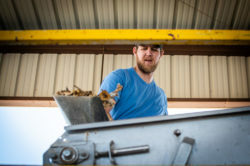 Nine fledgling businesses benefited from loan programs since 2015. Loans ranged from $4,500 to $25,000. The last loan was dispensed Dec. 16, 2016, to River Jumpers LLC. The MCE was launched in 2013 as an incubator for start-up businesses and a resource for existing companies. 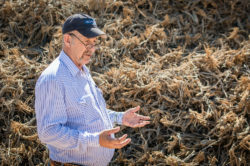 It was seeded by a USDA grant of $50,000. 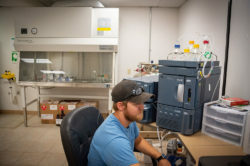 Another $120,000 of city-maintained funds was spent that year on a management agreement with Northern Arizona Center for Entrepreneurship and Technology (NACET). “It may have been a little bit before it’s time,” Mayor Christian Price said. City Council fenced with three consecutive executive directors over how MCE reported its progress, its transparency and its accountability, including for business loans. One qualifier for USDA loan candidates was that they had been turned down by a bank or other lending source. 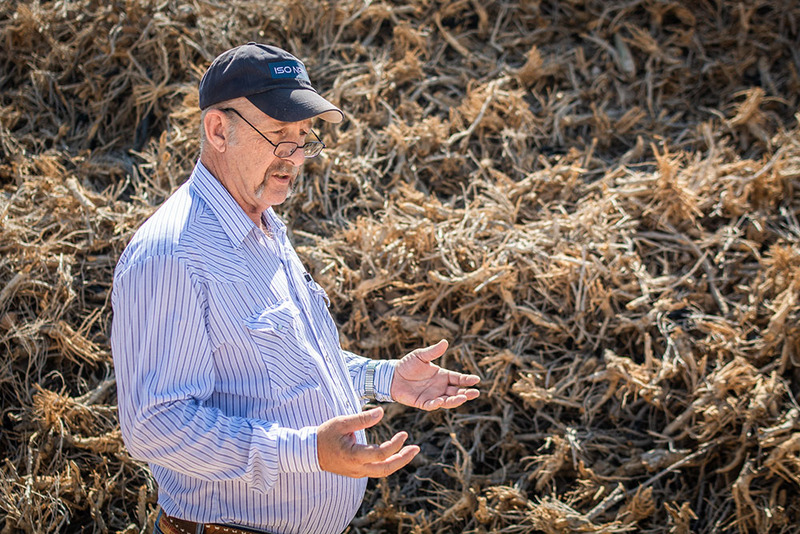 Low-interest business loans were an important part of MCE’s offerings since 2014. Two businesses paid off their loans. 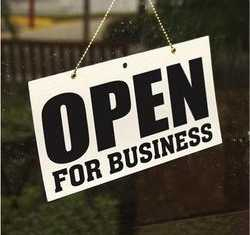 Some businesses that obtained loans no longer exist and the loans remain outstanding. Others say they are pushing forward and working at paying back the loans. Price said those results are the nature of incubating businesses just trying to get off the ground. “As for repayment, that’s something we’re handling internally now,” said Cassandra Brown, the city’s grants coordinator. The federally funded loans are in the City’s name, meant for MCE programs. Now the City and not MCE has the full task of tracking the loans. “We’re supporting these new businesses, and we’re actively working with these partners,” Brown said. WYS Education and True Reflections Boutique had loans of $5,000 and $6,000 respectively, and both wiped them out in less than two years. Several of the loan recipients no longer have functioning webpages and have not posted in social media in more than a year. In default or merely delinquent, four owe more than their original loan due to interest and fees. HobbyScopes LLC was the first business to land an MCE loan, which was from a revolving loan fund (RLF) in 2015. As an RLF loan was paid off, the money went back into the program to fund more small-business loans. HobbyScopes’ loan was for $6,000, but the company struggled and still has a balance to be paid. The next two recipients, Precious Hands Healthcare ($25,000) and ProX Detailing ($7,500), have had varying success paying down their loans. In 2016, though still questioning MCE’s accountability for the loans, City Council unanimously approved up to $200,000 for MCE expenditures. Shortly after, NACET fired the executive director, Dan Beach. Last fall, the city council effectively fired NACET, and MCE closed in spring. Price said that allowed the city to take a step back and find a different use for money it had dedicated to MCE. “We’ve taken those funds and beefed up our Economic Development Department and reallocated it to other departments,” the mayor said. Multiple attempts to reach loan recipients for comment were unsuccessful. 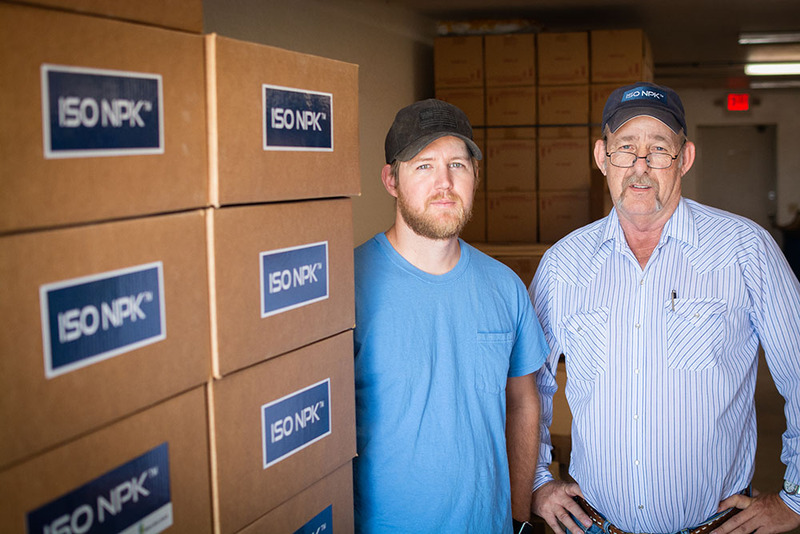 While many home-based businesses in Maricopa are trying to build their way into a storefront, others are taking the opposite route. 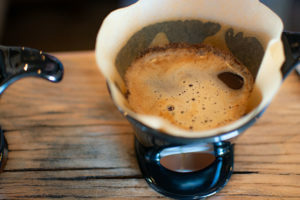 Crate Coffee Market, the highest-rated coffee shop in Maricopa according to Yelp reviewers, had a retail space for five years on Hathaway Avenue. But owner Jeff Kramarczyk has opted to close the doors Aug. 26. “The virtual marketplace has presented an opportunity to expand more globally while still meeting and developing our goals,” he said. 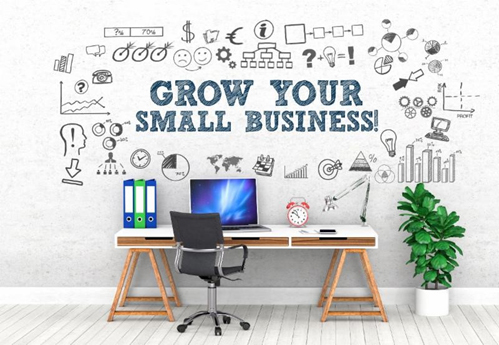 The primary reason for leaving the storefront is to focus attention, time and effort on the virtual side of the business. Despite closing the storefront, his business plan, he said, remains the same. Echoing that are the co-owners of CrossFit Stand & Battle, which also left its storefront space with its high overhead to literally go home in what was termed a restructuring. 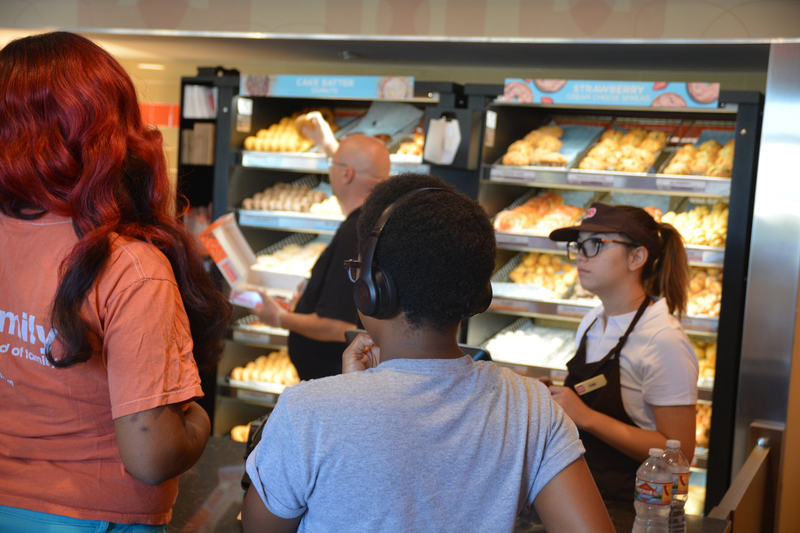 “Bringing it home has its benefits,” said Natalie Richardson, co-owner and director of operations. Her garage in The Villages was converted into a CrossFit gym in July. The change allows the team to provide the classes and hours to meet the needs of their schedules as well as the clients they coach, she said. Their business is an affiliate of CrossFit, Inc., an internationally known elite fitness regime designed to define fitness in a measurable way. The workout goal is fitness and health through functional movement and stability. The business plan, structured on the CrossFit model, is unchanged. It’s just the location that is different. Formerly CrossFit 347, Stand & Battle operated out of Suite B102 at 21576 N. John Wayne Parkway. Richardson began her fitness career in pre-natal and post-natal fitness for moms with Stroller Strides. Maxcy has trained as an athlete with CrossFit for years and is also a captain with the Maricopa Fire Department. 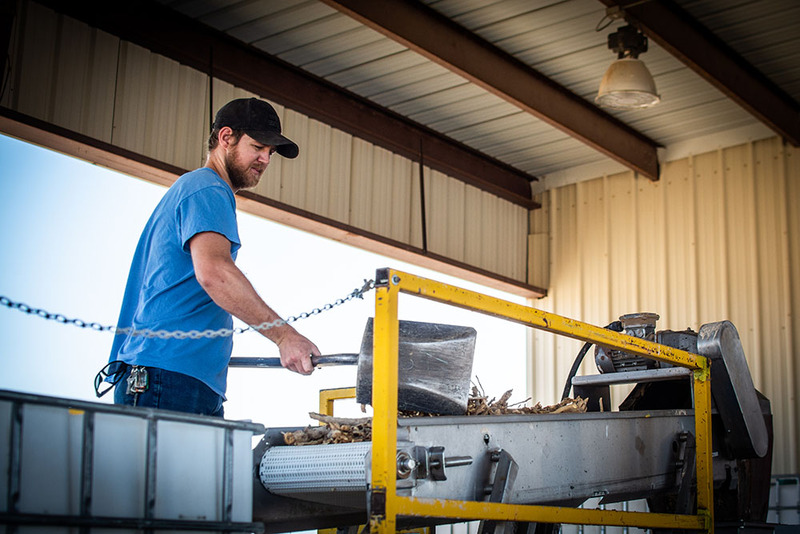 When asked why they left the brick-and-mortar store, Maxcy and Richardson said it fit their lifestyle and budget, and the garage gym concept aligned with their philosophy of hands-on instruction. Making the decision to take the business home came as they were approaching a deadline for a new lease agreement. They were no longer willing to put their families at financial risk. One challenge of moving from a storefront to a virtual or home-based site is convincing customers to come along, too. 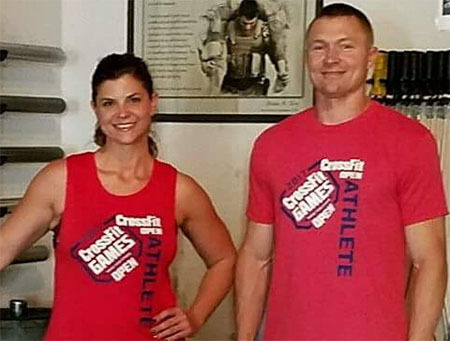 Maxcy told clients he would understand if some of them were not comfortable with a garage-gym format while he knew others were introduced to CrossFit in a home gym. Crate Coffee’s clientele was also disappointed to lose their community spot. A new company is putting people to work with paintbrushes in hand and healing in mind. VanGo 4 Kids hires independently contracted adult artists to paint outdoor murals and other artworks for customers. “It’s just to spread joy. We are wanting to employ people to help inspire others to overcome adversity,” said owner Gary Miller. Ten percent of proceeds will be donated to local organizations that help children. The idea came after a spontaneous painting session in Miller’s backyard. 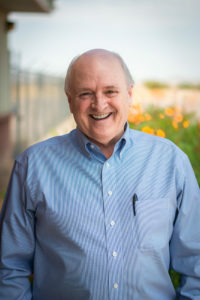 Miller, who has a doctorate in behavioral health, has spent the last four years on the Maricopa Unified School District Governing Board. He’s been its vice president since January. In June, Miller announced he would not seek re-election. He is also opting to avoid the congested morning commute into the Valley and spend more time with his family. “It’s really forced me to be creative and to be able to work locally,” Miller said. 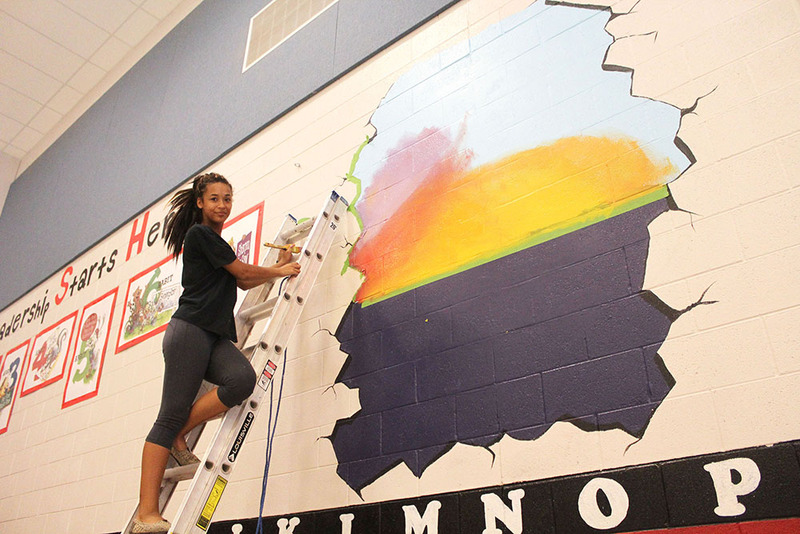 His new venture undertook its first mission at Maricopa Elementary School in July: a pro-bono project featuring a lighthouse mural reflecting the school’s new Leader In Me status. 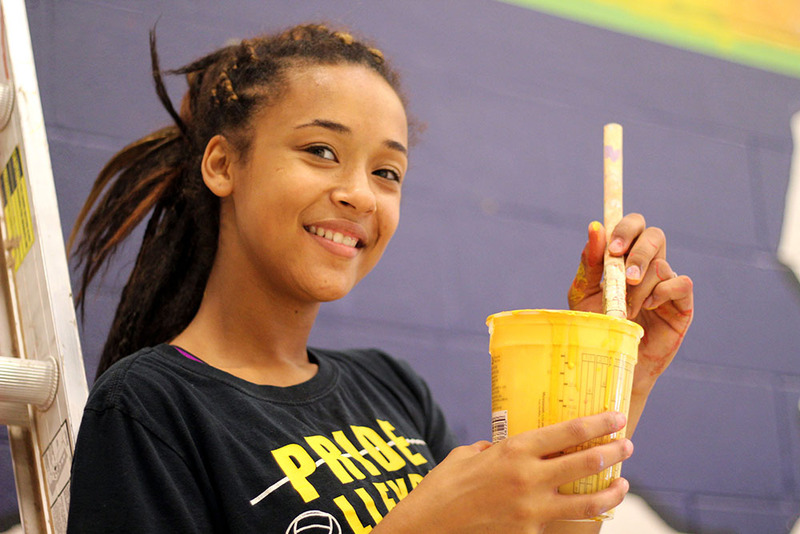 VanGo 4 Kids’ first resident artist, Kyra Richards, helped Miller sketch and illustrate the painting on the school’s gymnasium wall. Richards is a recent Maricopa High School graduate who will pursue a degree in art therapy next year – unsurprising given her background. At 7 days old, a car accident caused swelling and bleeding in her brain, seizures and other complications. She was unable to express herself with words. “My mom gave me crayons and paper and said, ‘Show me how you feel.’ I just moved up from there,” Richards said. A combination of self-teachings and formal art instruction has helped Richards find her voice in unconventional media. 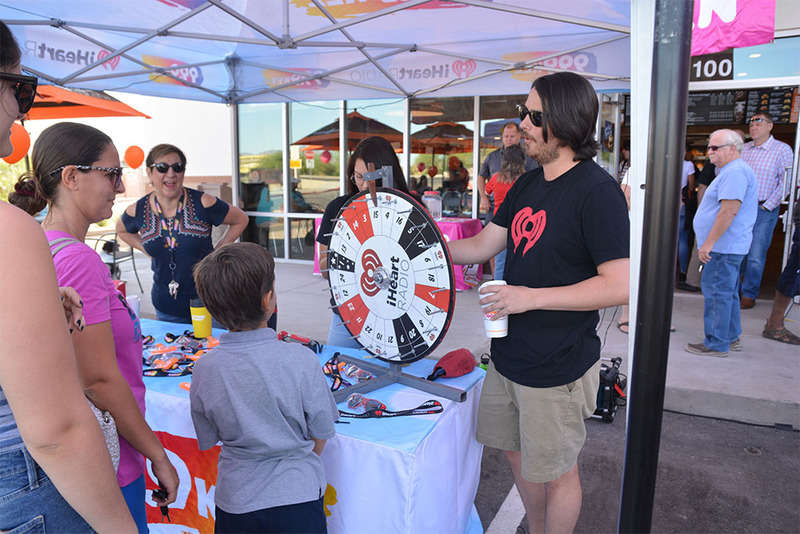 Miller wants his VanGo 4 Kids artists, and even his customers, to learn financial responsibility. 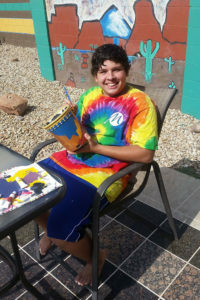 His son Frankie, 13, is already planning how he’ll save, spend and donate money he plans to make by selling his own art. “I usually like metal and wire. I have good vision,” Frankie Miller said. 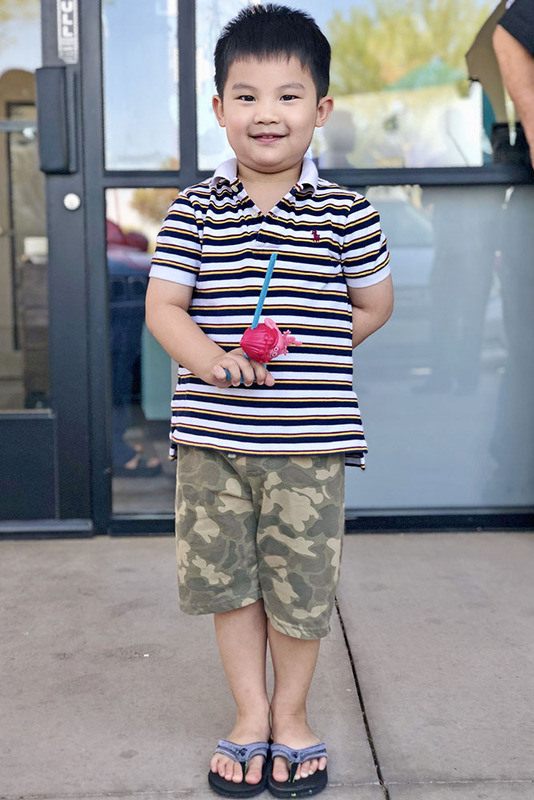 His dad envisions VanGo growing from mobile mural company to a company leading art classes, and even building a brick-and-mortar gallery one day. And no matter if it’s the artists or the art lovers, Miller said he hopes VanGo will inspire catharsis. 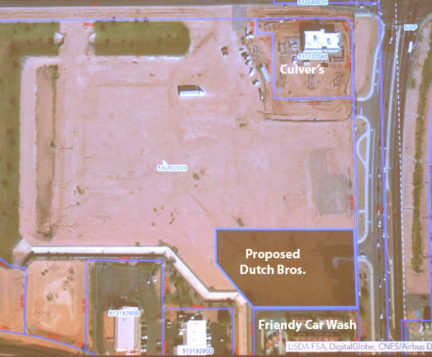 Dutch Bros. received a variance from the City’s Board of Adjustments July 17 to change the maximum setback on the property on John Wayne Parkway north of Fast & Friendly Car Wash where it plans to build a store. Tom Glissmeyer, director of development for Via West Group, said the existing water easement on the property was an impediment to complying with the setback standard. The variance increased the maximum setback 168 percent and places the front of the building more than 67 feet from the property line. Ross Dress for Less, ahead of its July 21 opening, installed a low-voltage, anti-shop-lifting system at the front door of its store at 205951 N. John Wayne Parkway. The store also received a permit July 16 for four signs with internal LED illumination. Daycare owner Marie Garcia, 43595 W. Chambers Court, passed fire inspection June 27. KB Home received a permit June 20 to remodel a home garage at 18174 N. Christopher Drive into a temporary sales office. The project is valued at $10,000. KB Home also received a permit for sales/construction office at 20209 N. Lauren Road in Homestead and picked up a temporary-use permit for its model home complex at 20181 N. Lauren Road. An empty office space at 20924 N. John Parkway is being re-worked, with Desert Metropolitan receiving a permit for interior demolition. The work is valued at $7,800. Jiffy Lube, being built at 37306 W. Merced St. west of Walmart, had a flow test for its underground fire line and hydrant June 27. EdKey Inc.’s Sequoia Pathway Academy received the OK June 28 for factory-built modular classroom buildings at the campus, 19265 N. Porter Road. The classroom space is estimated at 62-by-70 feet with electric but no water or sewer. The project is valued at $30,000. Community of Hope continued its remodel at 45295 W. Honeycutt Ave. with July 11 permits for remodel and relocation of factory-built building of three modular buildings, valued at $20,000. Burger King, 20699 N. John Wayne Parkway, received a permit June 19 to install a fire alarm for its business, which opened July 21. July 17, it was granted a permit for eight grand-opening pennants to be in place until Oct. 16. Legacy Charter’s new Sunrise Preschool received a permit July 3 for a fire alarm panel and smoke detector for its facility currently under construction at 19287 N. Porter Road. The project also received a permit for plywood signs on wood posts. WingStop, to be located at 20555 N. John Wayne Parkway, received a permit for two internally illuminated wall signs, at a value of $2,388. Maricopa Wells Veterinary Hospital was given approval July 5 for a temporary banner to be in place until Sept. 11. 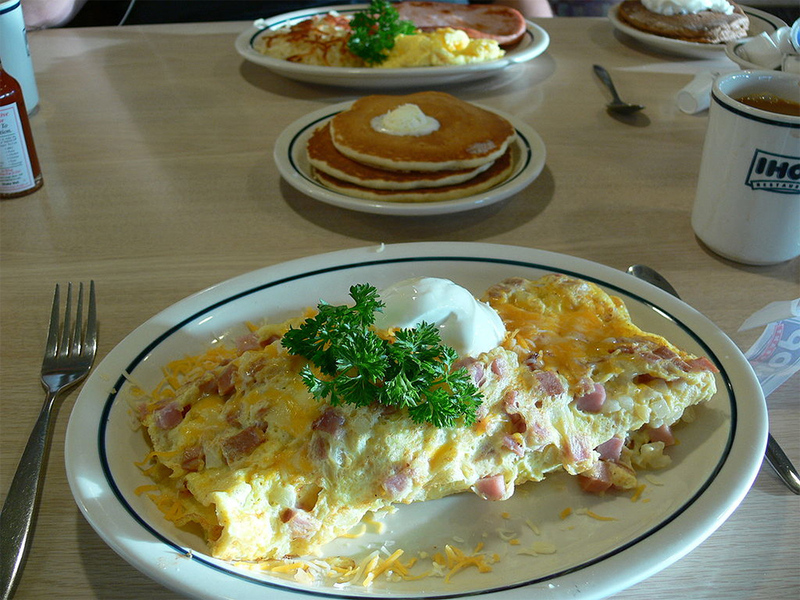 Only three Maricopa eateries were inspected by the health department of Pinal County June 16-July 15. All three earned excellent ratings. Medical offices planned for the southeast corner of Edison Road and John Wayne Parkway are designed to be two buildings with a connecting breezeway. Maricopa Planning & Zoning Commission unanimously approved the development review. Kazi Haque, the city’s lead planner, said the elevation “is a little bit different” and the city worked with the applicant to make some changes. As currently designed, doors to the buildings will be on the south side, with some spaces added to the already existing parking lot. The north elevation, facing Edison Road, will be the back of the building. The lot shares the area with Big O Tires, 99 Cents Only and Aaron’s. 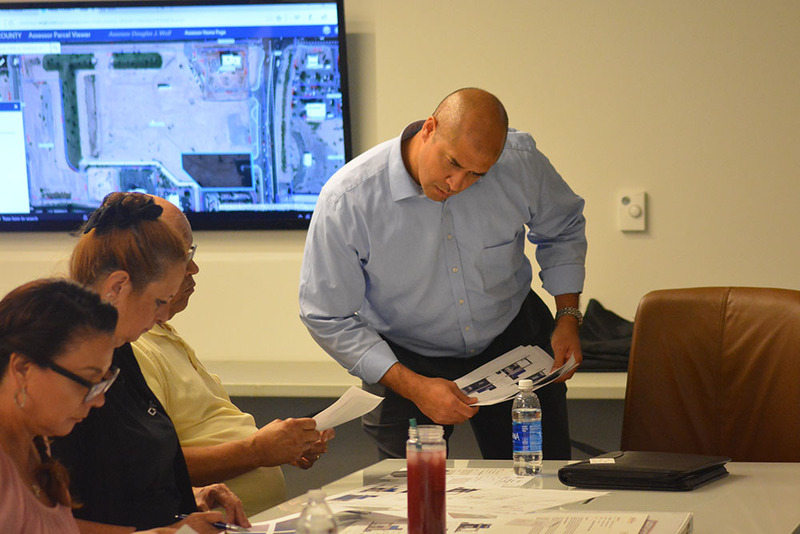 Edgar Felix of the RKAA Architecture firm said though Maricopa Police Department had expressed some concerns with the possibility of the breezeway hiding nefarious activity, the area will be fully visible from Edison Road. The project next goes before city council. All 11 food establishments in Maricopa inspected by Pinal County’s health department from May 16 to June 15 received excellent scores. Construction continues on Jiffy Lube west of Walmart. Sunrise Pre-School received a new commercial permit for its property at 19287 N. Porter Road. The school, which is directly east of Sequoia Pathway, is more than 10,000 square feet, including canopies, and valued at $1.4 million. Little Charmers Preschool and Daycare at 22314 N. O’Sullivan Drive received its annual residential fire inspection and earned its permit June 4. It also received a permit for a flow test of the hydrant on June 18. Dutch Bros. Coffee indicated its interest in building a drive thru in Maricopa with a presentation to the Heritage District Citizen Advisory Board June 14. The proposal for a store north of Fast & Friendly Car Wash on John Wayne Parkway is in the early review process. A proposed Circle K on the southeast corner of Honeycutt and Porter roads has onsite improvement plans under review by the City of Maricopa. Construction continued on Burger King in Edison Pointe at 20595 N. John Wayne Parkway and at Jiffy Lube at 42100 W. Maricopa Casa-Grande Hwy. Yale Management Services at 21596 N. John Wayne Parkway received its permit for a fire alarm and detection system on June 6. 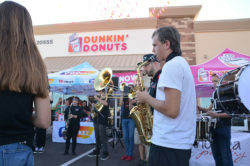 Dunkin’ Donuts, which opened in Edison Pointe June 8, received its fire alarm permit June 13. 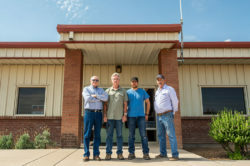 Pioneer Title Agency opened its doors June 29 at 21596 N. John Wayne Parkway, Suite 101. Crossfit Stand & Battle announced to its clients it was restructuring the business and would be moving out of its location at 21476 N. John Wayne Parkway after July 1. 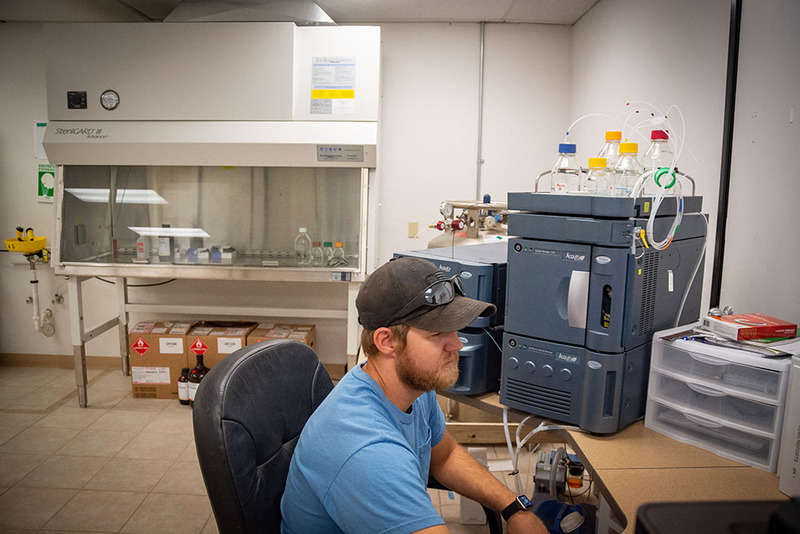 Owners opted to move training into residential garage gyms because the state of commercial real estate in Maricopa made continued leasing unworkable. Walmart received a permit May 16 to sell fireworks at its store at 41650 W. Maricopa-Casa Grande Hwy. 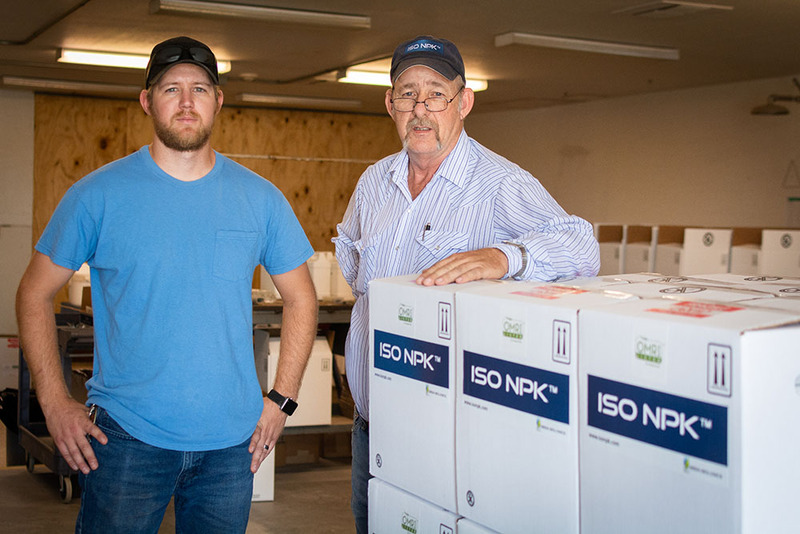 Fireworks Productions of Arizona received a permit June 13 to produce the fireworks display at Maricopa’s annual Great American 4th. KB Home received a permit June 11 to convert the garage of a model home on Laurel Road into a construction office for Homestead. KB Home also received a permit for two wood signs at the location. Maricopa Auto Outlet received a permit to replace the sign faces for the business at 19864 N. John Wayne Parkway. Super Smiles at 21116 N. John Wayne Parkway received a permit for an LED aluminum sign. After its opening, Dollar Tree received a temporary sign permit May 31 for its grand opening. Mobile food vendor Zonia Fuentes of Sonora Hot Dogs LLC received a zoning permit to sell at 44301 W. Maricopa-Casa Grande Hwy. Four Directions received a zoning permit June 6 for an adult group home at 41545 W. Anne Lane. After time ran out on previous permits, the City of Maricopa’s Heritage District project received four new permits June 4 to demolish blighted properties. Two were on Maricopa-Casa Grande Highway, one was on Pershing Street and one was on Burkett Avenue. The work was carried out by Breinholt Contracting and valued at $22,500 per property. 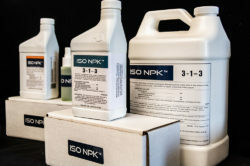 This item appears in part in the July issue of InMaricopa. 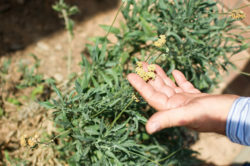 Guayule (gwa yoo lee). Not a well-known word. If you haven’t heard it before, you probably will, especially if you live in Maricopa. Guayule is a silver-leaved shrub of the daisy family indigenous to the southwestern United States and Mexico. It grows locally. 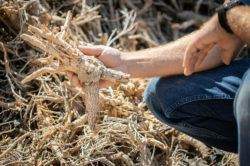 It was cultivated in the early 20th century by industry and investment pioneers such as Henry Ford and John D. Rockefeller for its promise to produce rubber. 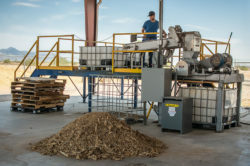 The sap of the plant yielded a high volume of latex that produced a rubber compound. 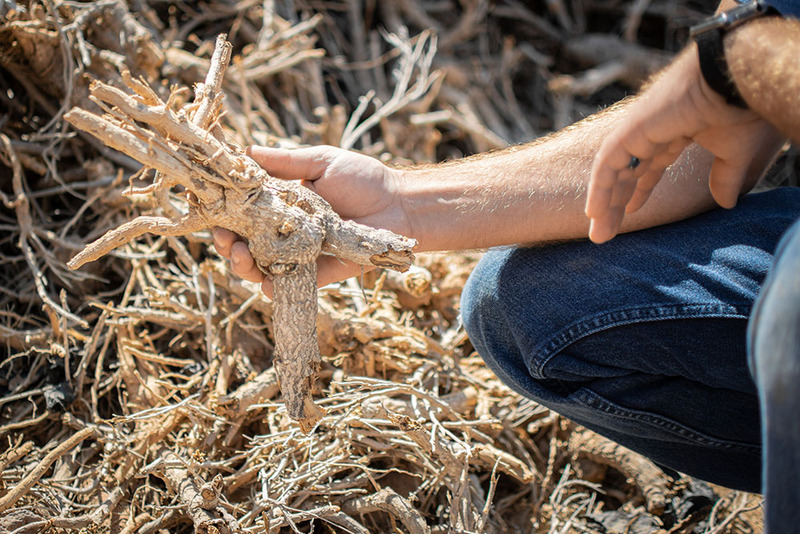 It served a multitude of applications including the World War II effort led by Dwight D. Eisenhower when he was a colonel in the Army in a study of guayule as an alternative to rubber. Fast-forward to 2014. Lance Beem, a plant physiologist working at the University of California-Davis, conducted trials on the guayule plant for its potential to increase crop growth. He found he was really onto something significant and far-reaching. 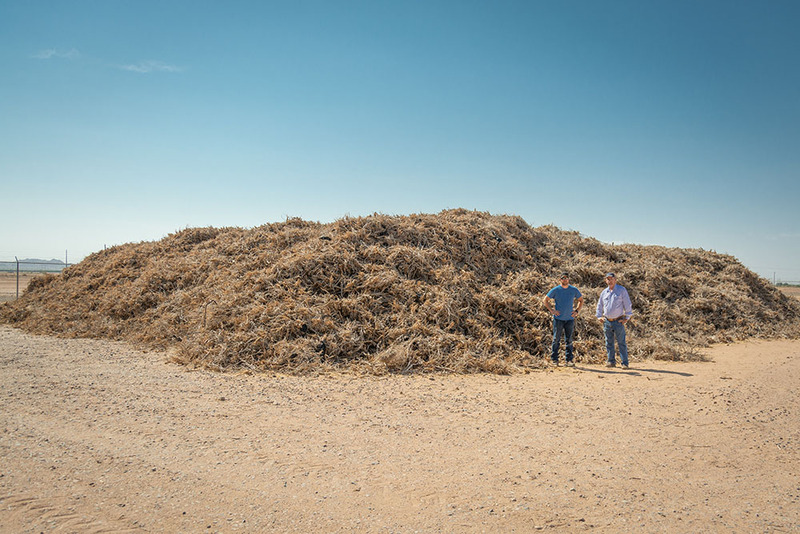 He discovered he could extract from the guayule plant a property that would increase crop yield to growers. It is called ISO NPK. It’s a bio fertilizer. It is naturally sourced, non-toxic and certified organic. Events shaped rapidly from this discovery. Beem Biologics was established in 2014. Four founding members – CEO/Chairman Stephen Butler, PhD, COO Ben Cloud, Director Lance Beem and Director Rodolfo Manzone, PhD – came on board with experience and expert skills to develop a new product with great possibility. 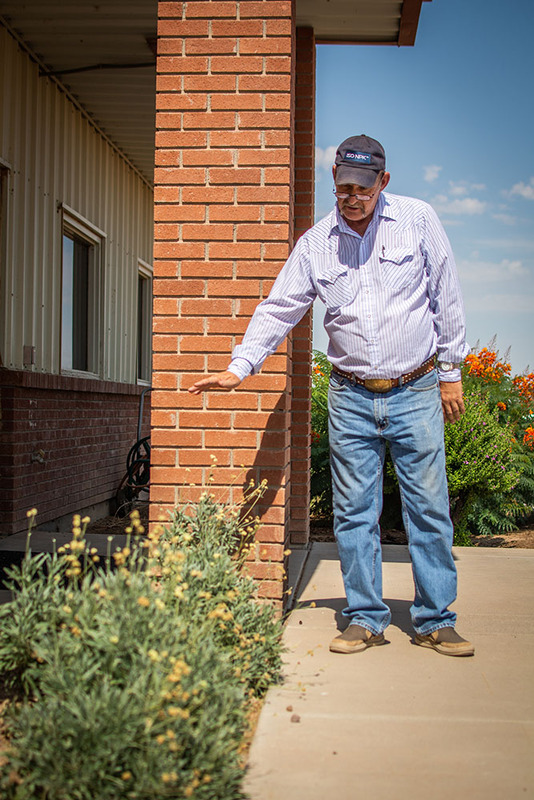 Development continued with the founders opening a facility in Maricopa, a rich, agricultural resource area that has the guayule shrub growing in abundance. 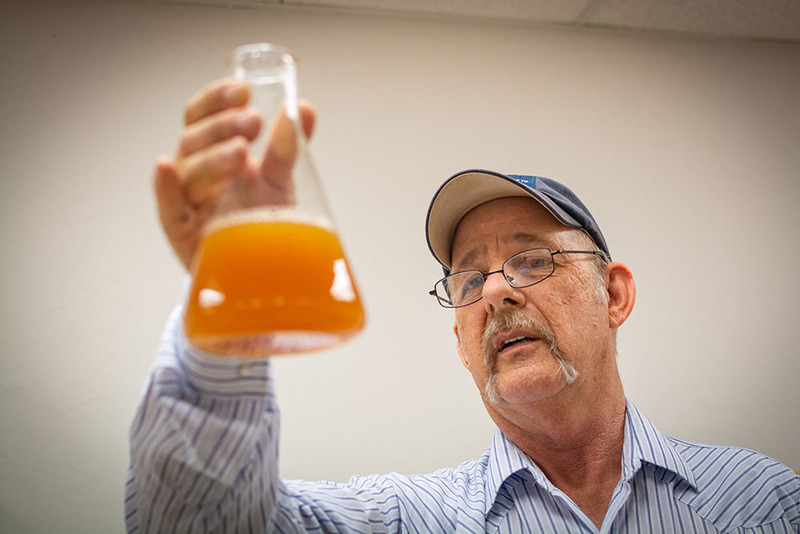 Research and development continues at UC-Davis. 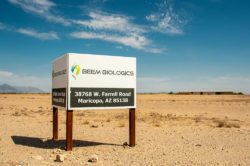 Beem Biologics has entered a licensing agreement with one of the largest crop protection industries in the world – Arysta LifeScience – and has conducted successful, broad-spectrum field trials of ISO NPK. 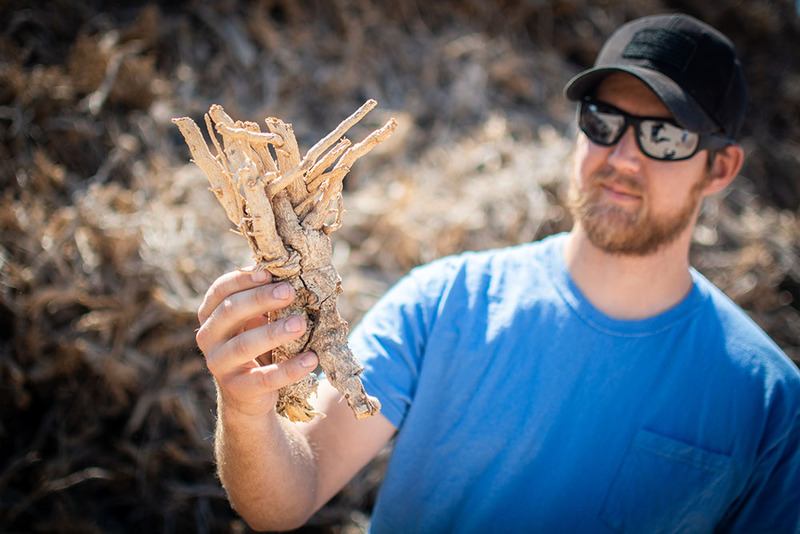 Biological compounds, or AG biologicals, provide many of the answers that face the chemical crop industry. 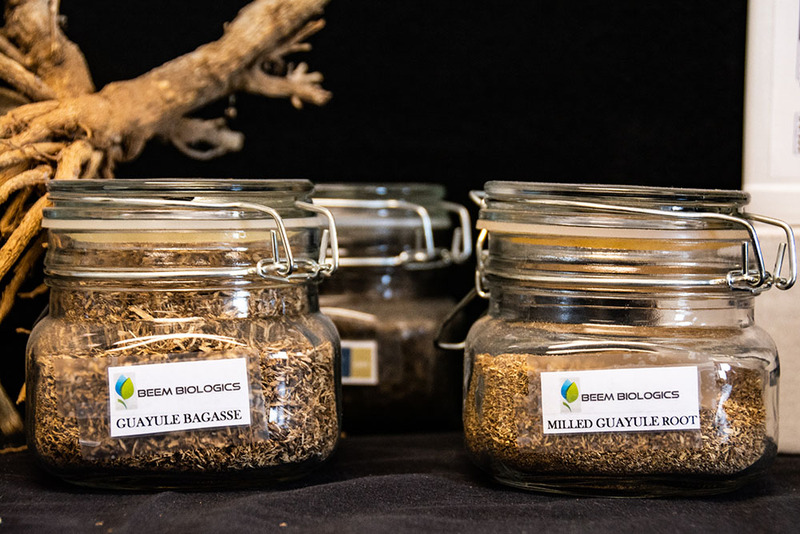 “At Beem Biologicals, we intend to advance ‘Healthy Soil, Healthy Food and a Healthy Planet, based on science,’” Cloud said. Beem Biologics currently has an inventory that would provide product to 1 million acres. 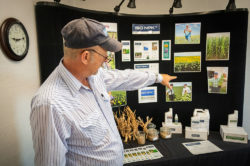 Beginning in 2019, marketing will expand and the projected growth will be 10 million acres of product coverage to meet market demands over the next five years, according to its business plan. 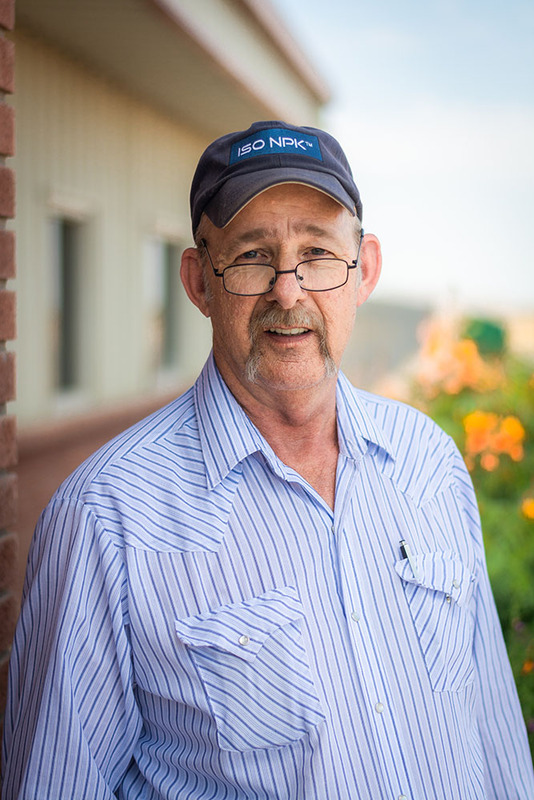 Rick Brower is the operations manager. 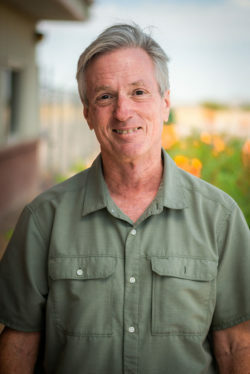 He is an Arizona native who has lived in Maricopa since 1988. 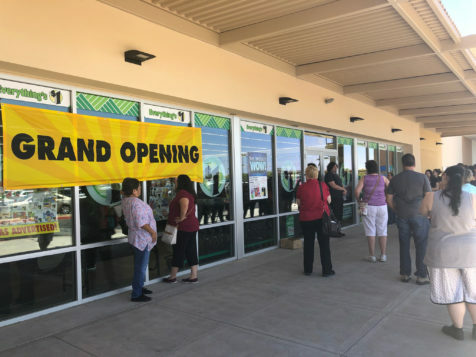 Rosati’s Pizza will be opening a 1,050-square-foot pizza restaurant in Maricopa Station in the space formerly occupied by Zoyo Yogurt. Maricopa Station is located just north of the CVS on the NEC of John Wayne Parkway and Smith-Enke Road. Rosati’s will be at 21423 N. John Wayne Parkway, Suite 102. It will be carry-out and delivery. 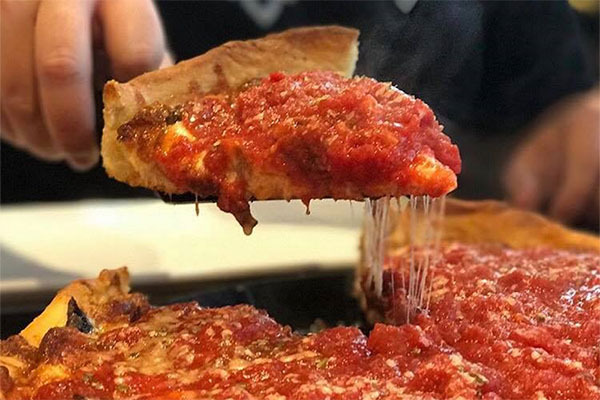 The first Rosati’s Pizza in the Chicago area opened in 1964, with the Rosati family picking up where their father Sam Rosati left off, with old-style Italian flavors. Dena Zell of ZELL Commercial Real Estate Services represented the landlord on the lease. A company with roots deeply planted in the Arizona business community announced the grand opening of its Maricopa location. 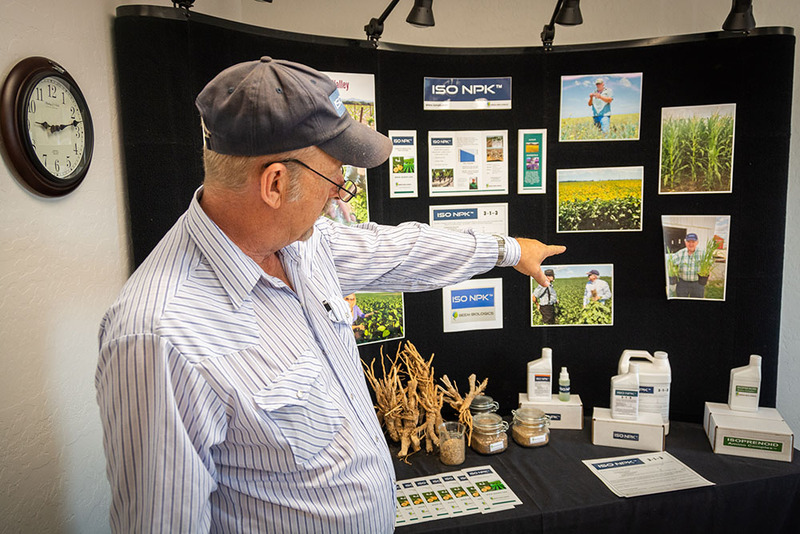 When: June 29, 3-6 p.m.
Pioneer Title Agency has one other office in Pinal County and 70 branches across the state. The Maricopa office, located in the Cobblestone Fiesta shopping center at 21596 N. John Wayne Parkway, Suite 101, will host a ribbon-cutting ceremony June 29 at 3 p.m.
Food and drink, a wine tasting, catering from Dickey’s Barbecue Pit and live entertainment will be free for the community at the event. The public can also sign a “massive” ribbon that will be cut and then preserved for display in the office. Branch Manager Stacey Cyr is a longtime Maricopa resident who most recently worked at Empire West Title Agency. 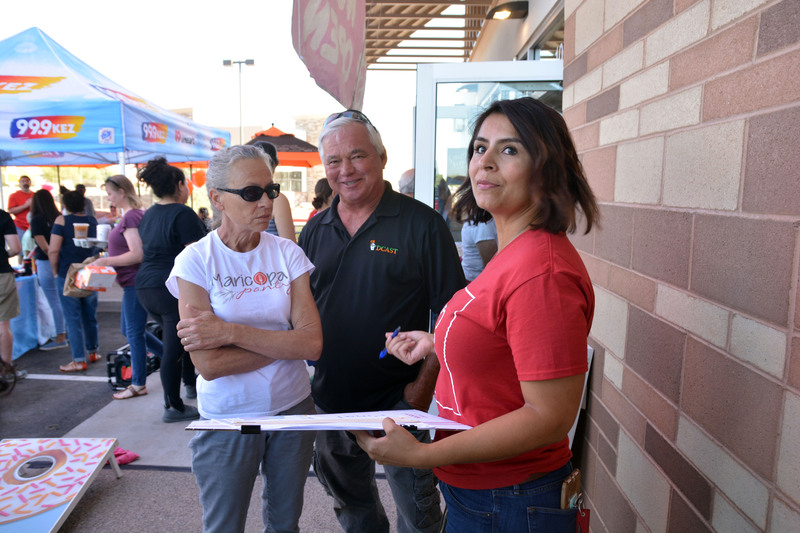 “We are focused on not only providing title insurance, escrow, trustee sales and builder-related trust services across Maricopa, but also being good community volunteers and a voice for both business and economic development for the county,” Cyr said in a press release. Described as a real estate veteran and a local business advocate, Cyr plans to launch the county’s first Business Networking International chapter this year. There, Cyr would volunteer as the organizations secretary-treasurer, according to the release. The community-spirited branch manager has also planned a series of activities in October with nonprofit organization Save the Ta-Ta’s. 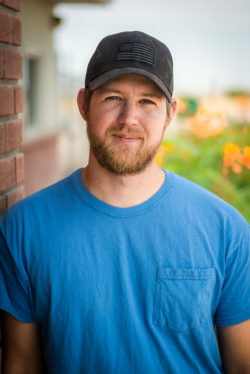 The Pioneer Team also includes Business Development Marketing Representative Matthew Sheldon and Cyr’s son Damian who will serve the agency in an administrative role. Smiley Dental, the Maricopa Chamber of Commerce and members of the public celebrated the grand opening of the new dentist office Thursday with a ribbon-cutting. Dentist Tin Nguyen and his staff offered free fillings, extractions and cleanings to the first 20 people in need of dental care. Smiley Dental is in the Fry’s Marketplace Plaza at 20917 N. John Wayne Parkway, Suite A-105. 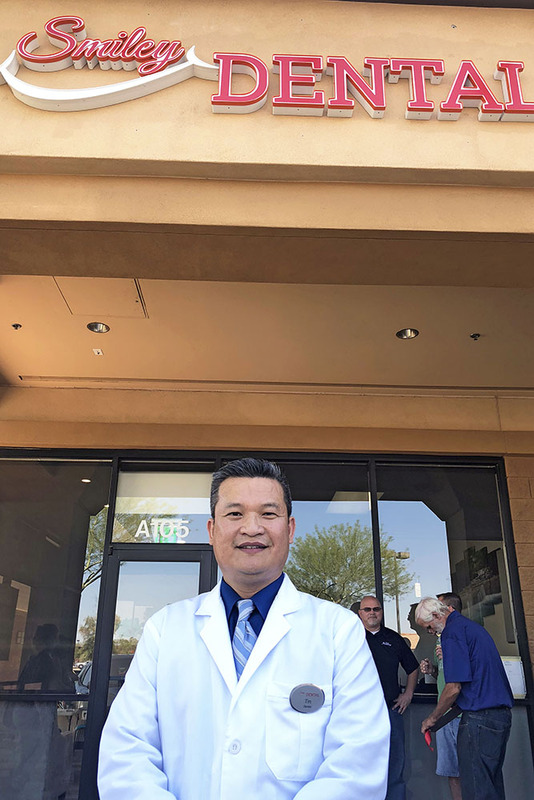 Maricopa dentist Tin Nguyen opened his practice last month and will celebrate the grand opening with a ceremony Thursday. When: June 21, 9:30 a.m.
Invisalign braces and dental implants could be offered in the future as well. 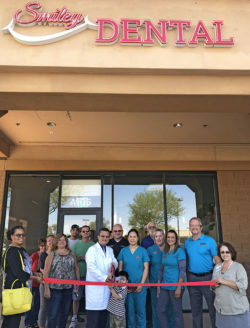 During the office’s ribbon cutting event June 21 at 9:30 a.m., Nguyen and his team will provide free extractions, fillings or cleanings to the first 20 people in line. 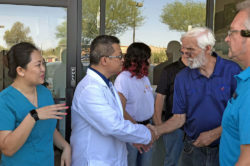 Low-income patients and those without insurance coverage are eligible to choose one of the three services free of charge and will be scheduled an appointment for that day. 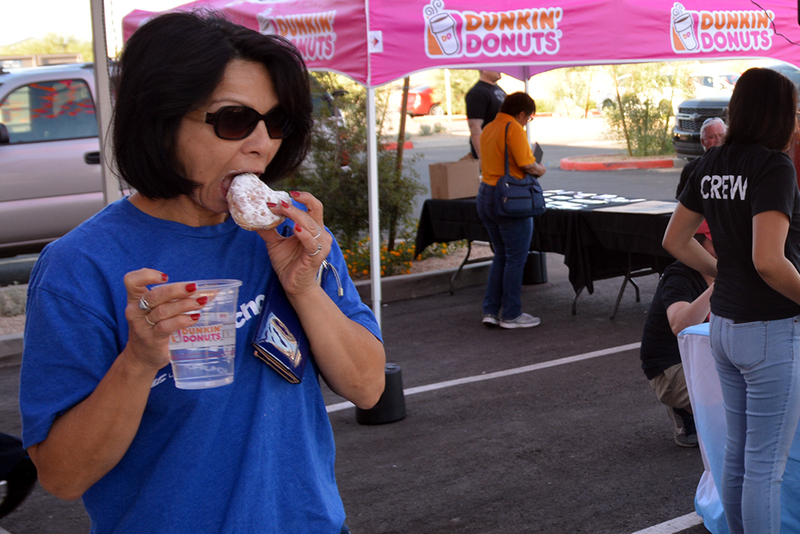 “I like to be involved with the community and also to give back,” Nguyen said. The dentist’s giving spirit won’t end at the ribbon-cutting. Nguyen plans to have “community service days” where he offers certain services for free to those in need every year. “I’m thinking about also bringing some (free) services to the veterans here on Veterans Day because I’m also a veteran myself,” he said. 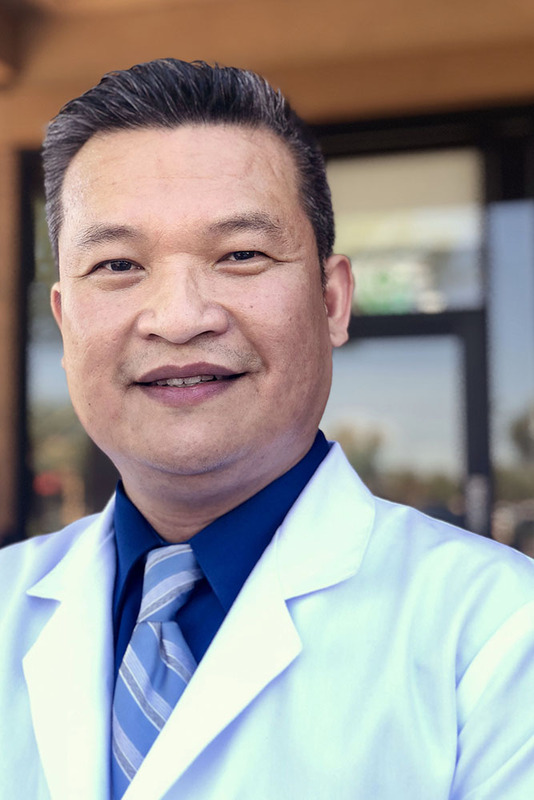 A dentist for the past 15 years, Nguyen was previously a lieutenant commander in the U.S. Public Health Service Commissioned Corps. He also performed dentistry services to the Colorado Indian Tribes in Parker. 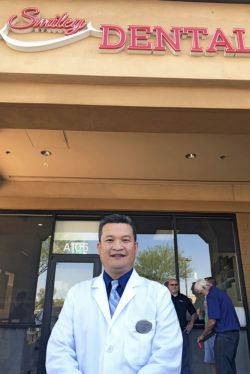 Nguyen chose to open his practice in Maricopa because of the small-town feel – similar in size and population to where he used to live in Lake Havasu City. 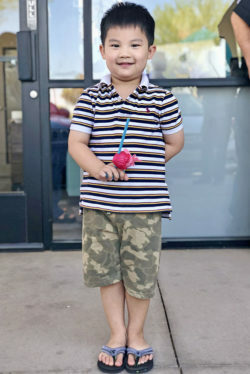 Nguyen and wife TLan live in Maricopa with their children who attend a local school. Smiley Dental’s staff also lives in the city. 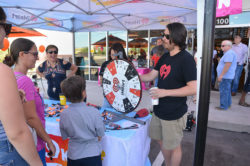 In July, Smiley Dental will attend the Great American 4th celebration at Copper Sky where staff will handout “dental goodies” and provide free dental screenings. For more information, call the office at 833-793-7773 or visit their website and social media. Still in early stages, a proposal for a Dutch Bros. Coffee store, with drive thru, came before the Heritage District Committee on Thursday. 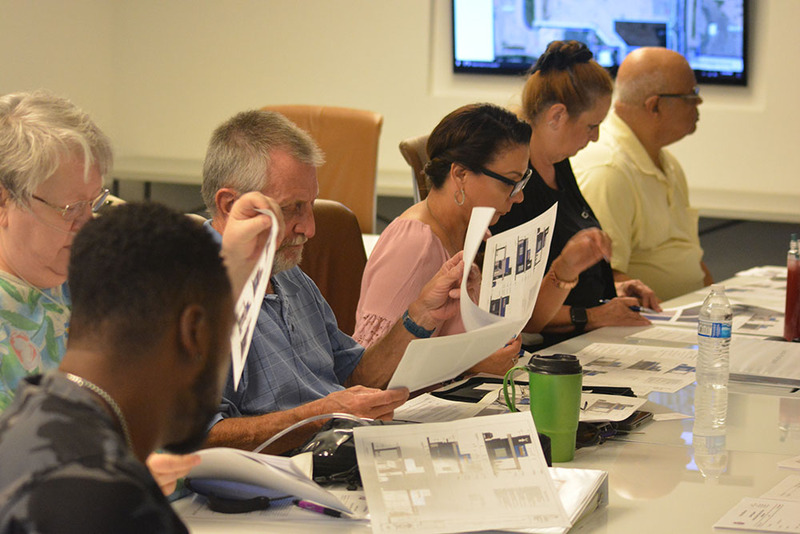 Dutch Bros. Coffee is proposing a store in Maricopa, and the Heritage District Citizen Advisory Committee received an early look at plans Thursday. That’s because the committee gets an opinion on any development in the Heritage District. Dutch Bros. Coffee’s proposal is on the north side of Fast & Friendly Car Wash.
City planner Rudy Lopez said the project still has to go through site plan review and meet criteria currently under discussion. Developers are also seeking a variance. The project uses an existing access from John Wayne Parkway, but Lopez said there is an easement on the frontage. Project Manager Michael Oakleaf of Archicon Architecture & Interiors said the current plans make sacrifices to fit into the area. That included abandoning some elements and using a color scheme that would “blend in” with the neighboring car wash.
Oakleaf said those concessions are unusual. “We’re giving up a lot,” he said. In what Chairman Brian Foose called “a formality,” the committee unanimously voted its support for the project. Michael Oakleaf, standing, explains elements to the committee. 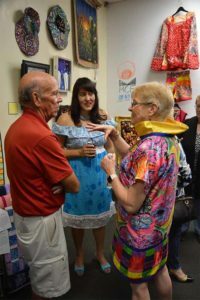 Martin has owned AnymMystik Art & Apparel, a home-based design studio in Maricopa, since 2016, but she has spent a lifetime creating. Her garments are always colorful and often incorporate large bold images like a guitar or a cat’s face. 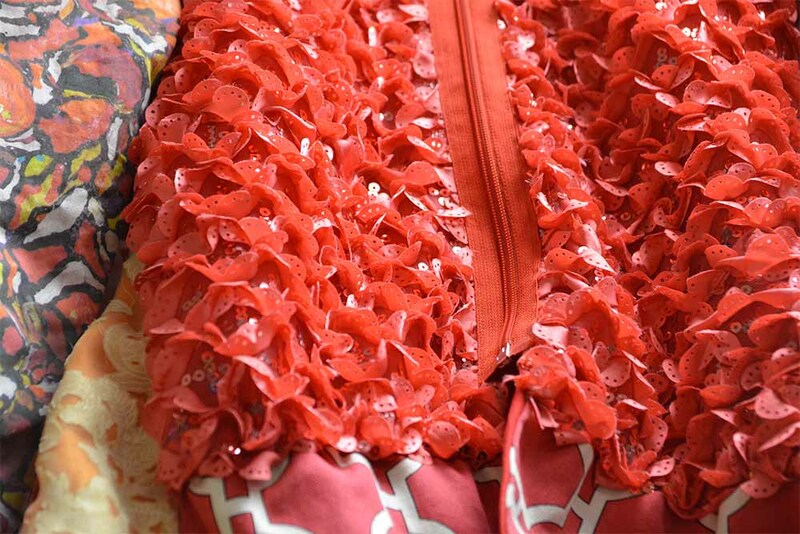 She uses recycled material, cast-offs given to eco-fashion designers by fabric manufacturers. An instructor for eight years at The Art Institute, Mart employs techniques in quilting and layering for constructing garments and may combine that with painted textiles. “The painting, the quilting, the layers, the various textures kind of sum up my whole wearable art in fashion,” Martin said. Feedback from fashion shows indicates she should include more painting, and listening to potential customers can impact her direction. 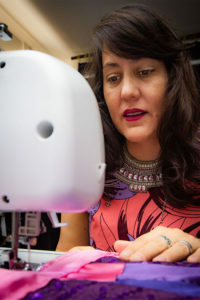 She was one of seven designers participating in the first Arizona Eco Fashion Week in April at the Fashion and Business Resource Innovation Center (FABRIC) in Tempe. That is the home of the Arizona Apparel Foundation and is built to foster and network local designers. Earning her spot in fashion shows has also been a boon. The reasons go beyond the creative. 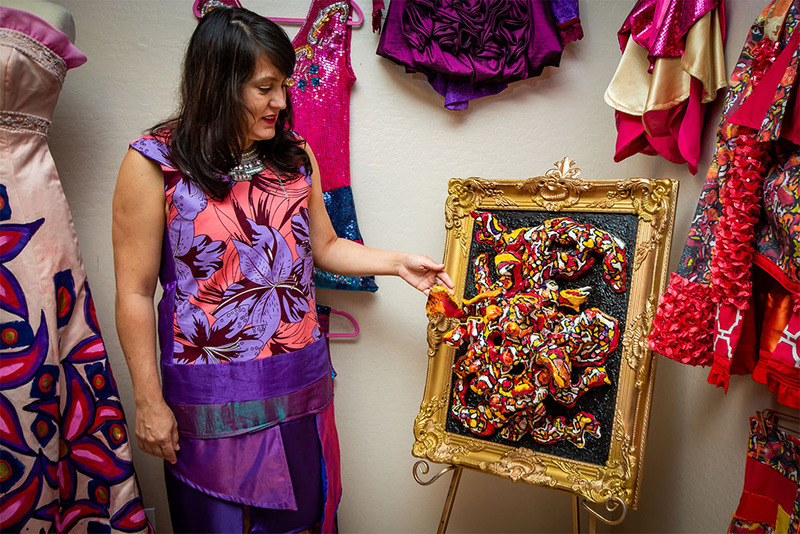 She has exhibited her work at LabelHorde Fashion Show, Sacramento Fashion Week, Arizona State Fair (three blue ribbons), Costume Society of America and more. Martin has two master’s degrees. She was working on her Master of Fine Art at University California-Davis when she had her son Collin. In his own way, her son has become part of the business. Collin and his friends have modeled Angelina’s clothes for her collections. 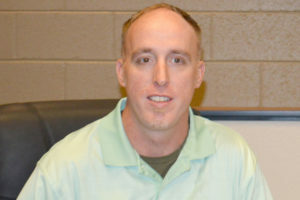 He graduated from Maricopa High School in May. 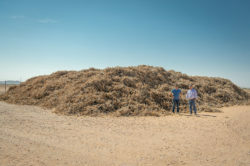 And Martin’s heritage has informed her decisions as a designer and artist, notably creating a “coral creature” sculpture that was photographed and turned into a print. Two years after earning her first master’s degree, Martin became an instructor and director at The Art Institute. She first taught in Austin, Texas, then in Sacramento, California. 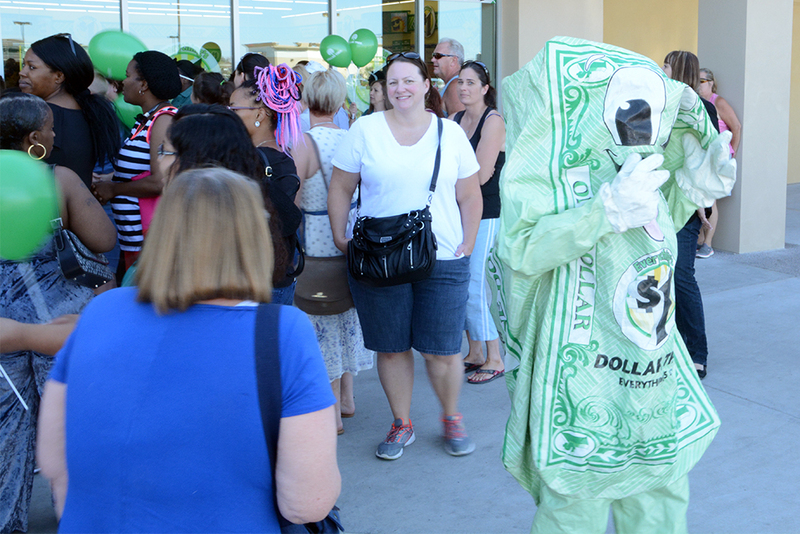 Dollar Tree received its commercial tenant improvement permit May 10 for its newly opened store valued at $145,000. The store got its automatic fire sprinkling system permit April 30, and a fire alarm permit on May 9. The store also received an aluminum sign permit valued at $6,000 May 15. Dollar Tree is located at 20797 N. John Wayne Parkway. Community of Hope Church is undergoing improvements inside and out. 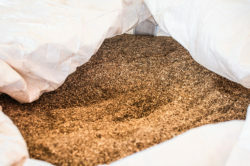 It received an automatic fire sprinkling system permit May 15 and a permit to begin moving electric wires underground April 19. The redirection of wires will benefit future community streetlights in the area. The church is also in the process of repairing damaged sidewalk on Honeycutt Avenue. Reconstruction for the sidewalk began May 14. Businesses receiving fire sprinkler permits include Dunkin Donuts April 17 and Burger King on May 14. Smiley Dental received a sign permit April 18, valued at $2,000, and Verizon received a permit for a new sign April 19, valued at $4,500. Pioneer Title, 21596 N. John Wayne Parkway, received a commercial tenant improvement permit valued at $80,000. Maricopa Development Company received a permit for a sales/construction office valued at $3,000 on May 7 at 37346 W. Leonessa Ave. KB Home received the same permit May 10 at 18166 N. Christopher Drive valued at $4,000. Police and fire stations received capital improvement project permits. Copper Sky Police Substation plans to progress to phase 2, including expanding the parking area. The project is valued at $500,000. Fire stations on Bowlin Road and Alterra Parkway will both be receiving new shade structures, valued at $11,920 and $18,375, respectively. Fire Station 575 on Edison Road will be getting a new fuel tank valued at $32,709 from a permit received May 7. 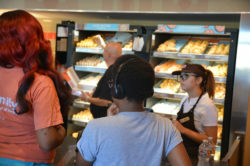 Dunkin Donuts is going conducting employee training in preparation for its June 8 opening date. Maricopa City Council approved a temporary sign permit on May 10 for businesses impacted by the construction of the overpass in midtown Maricopa. 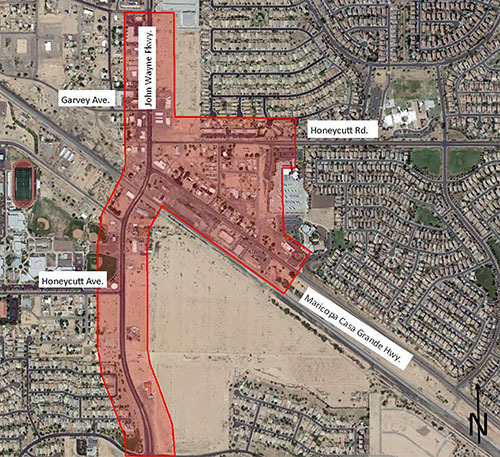 The permit applies to businesses and nonprofits within 300 feet of the affected roads – John Wayne Parkway between Hathaway Avenue and Desert Cedars, Maricopa-Casa Grande Highway between John Wayne Parkway and the Maricopa Unified School District office, and Honeycutt Road between John Wayne Parkway and the MUSD Transportation office. The temporary signs include a 32-square-foot banner and a 32-square-foot ground sign. They cannot be placed within 40 feet of another sign and cannot interfere with pedestrian or vehicle traffic. Applications are available at City Hall. The application packet includes examples of specifications. 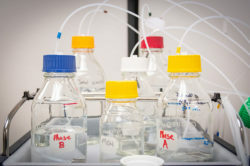 The application process takes up to five days. Interim City Manager Trisha Sorensen said the program is similar to the temporary holiday sign program the city offers. The Ak-Chin Pedestrian Bridge opened March 28. The bridge links Harrah’s Ak-Chin Casino with UltraStar Multi-tainment Center. Crossing over the roadway between the two properties, the bridge is 180 feet long and air conditioned. There are elevators at each end, directly linking the bowling alley with the new parking garage at the casino. 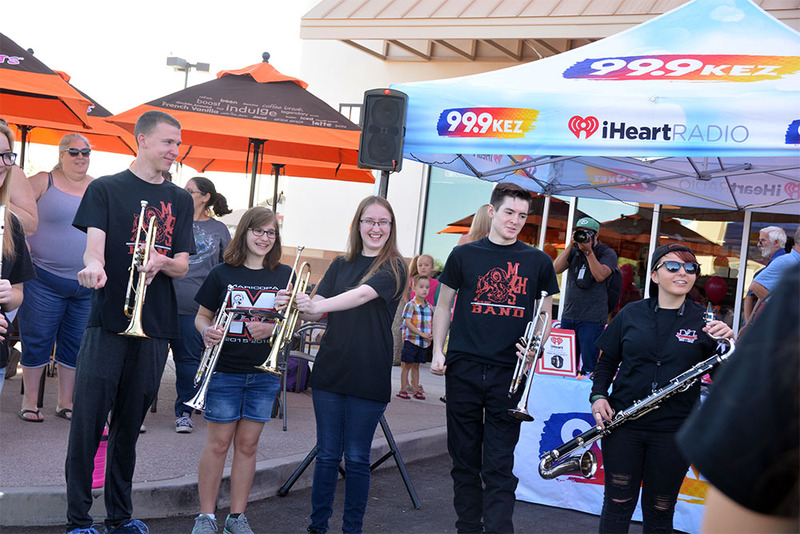 Maricopa’s newest athletic gym officially opened March 27. Planet Fitness, 20595 N. John Wayne Parkway, Suite 400, is staffed 24 hours a day. 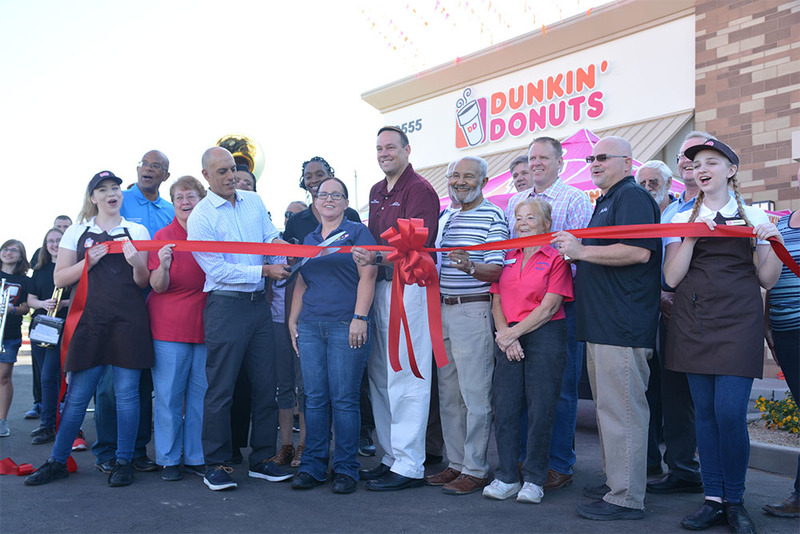 City leaders and Maricopa Chamber of Commerce held a ribbon-cutting ceremony. The planned Dunkin Donuts at Edison Pointe received a commercial tenant improvement permit for its 1,811-square-foot space in the western building. That is valued at $238,708. Its business license is pending. 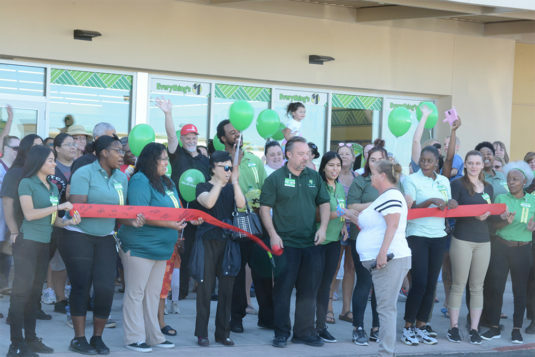 Dollar Tree, moving into Edison Pointe adjoining Fry’s Marketplace, also received a tenant improvement permit for its 9,920-square-foot space. The project is valued at $145,000. Its opening is set for May 10. 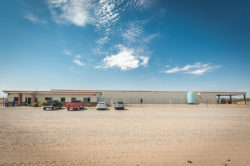 True Hearts received final inspection April 10 at its location, 19428 N. John Wayne Parkway, the former business barn. Legacy Charter received a permit April 10 to make on-site improvements for Sunrise Preschool at 19287 N. Porter Road, valued at $98,658. Respados Locoz received a zoning permit for its mobile food vending at 44274 W. Smith-Enke Road. Burger King, 20595 N. John Wayne Parkway, received permits for illuminated signage, logo and drive-thru menu boards as well as a monument sign. It is scheduled to open this spring.